8:00 a.m., 10:00 a.m, 5:00 p.m.
8:00 a.m., 10:00 a.m., 5:00 p.m.
Every Wednesday at 7:00 p.m. in the church, Father Casey will be holding Catechesis covering the topics listed below. All are welcome! Every Tuesday at 7:00 p.m. at the St Francis Catholic Center at 1757 Stanley Street, our Coordinator for University Outreach, Emily Newgard, will be offering a home cooked meal for students. Please feel free to invite friends... All are welcome!! October 4, 2018 - 6:00 p.m.
Join us at 6:00 p.m. for Mass and at 7:00 p.m. for a Catered Dinner to celebrate our Patron Saint Feast Day. 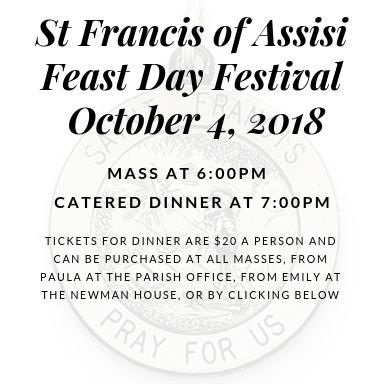 Tickets for dinner are $20 a person and can be purchased at all masses, from Paula at the Parish Office, from Emily at the Newman House, or by clicking on the button below. 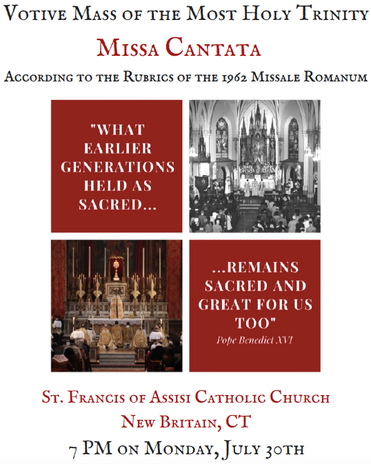 ​Votive Mass of the Holy Trinity - 7/30/18 - 7:00 p.m.
St. Francis is hosting a visiting priest, Fr. Van Lieshout. He is presiding over a Votive Mass of the Holy Trinity in the pre-Vatican-II rite. Join us for this exciting event!